Evil Corp is a game of business and betrayal. Players take on the roles of corporate giants, each with their own twisted view on how to save the world in which we live. All you need to do is acquire your R&D startup companies, develop your prototype product and then release your killer app to win. But the other players will do everything they can to stop you. The Eye of Providence features heavily in the design of the game. It really speaks to the themes of control and omnipotence that are laced throughout the design of the game. Even the box for the game is a ziggurat. Which works well as storage for the folded up hex game board. Each sector of the board acts as a trade region with three prosperous cities ripe for business development opportunities. 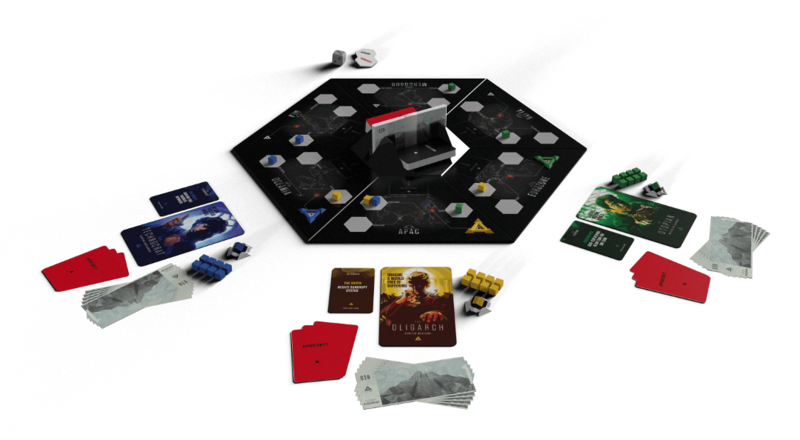 The art style on the board is minimalist and futuristic, lending well to theme of the game. More so does the art style of the CEO cards. Each has a vibrant coloured background with a shadowy portrait of the CEO plotting their malevolent schemes. Just looking at these guys makes your skin crawl! 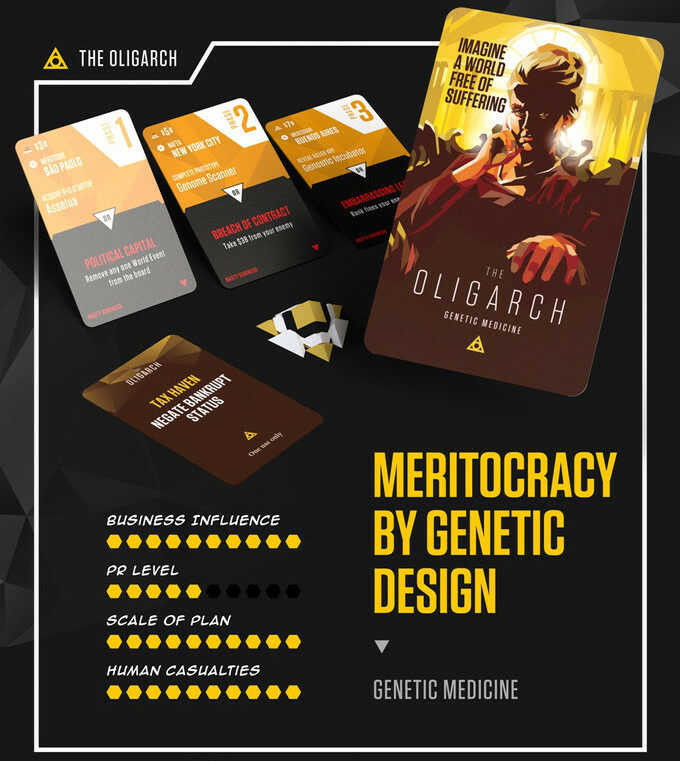 Throughout the game, players will build businesses on the board to generate income. World events are played at the start of each player turn and effect certain regions, having an effect on everyone’s income while they are in play. Keep an eye on the other players when they are calculating their income. If you smell something fishy, call them out to be audited! But make sure you can prove it, otherwise you might find yourself done for defamation. The game has a fantastic ‘cheat if you think you can get away with it’ style rule. It encourages players to get ahead by any means they can, which, again, plays into the themes of the game. To build the business, players need to use the cards they’ll have in their hand. Cards are split into three phases that need to be built in order. As you build more phases, your own HQ can level up, increasing your hand limit. But only when you build all three phases of your own colour can you enact the secret plan! If another player has built your phase, then you’ll need to make some Hostile Takeovers to claim it off them. The cards are also double purpose. Instead of using them to build businesses, you can use the Nasty Business side of them. These actions can allow you to make hostile takeovers, force dice re-rolls or counter other Nasty Business. This is where the take-that element of the game comes in. Forcing a scandal on other player can be enough fun on its own, but you may even manage to force them into Bankruptcy! And just building the three phases of your evil plan is not enough to win Evil Corp. Once a player has all three phases then they can claim end game. It’s like going into a press conference and saying, “OK guys. I have a plan that’s totally going to save the world and everything will be great again!” Of course, none of the other players buy it, and they have plans of their own they’d like to act on. At this point there is a final round where all the other players have a chance to play any of the Agent cards they’ve stashed throughout the game. Agents need to attack and beat each phase to stop that player from winning, and instead eliminate them. However, this is both hard to do, and down to the roll of the dice. This is where we have a bit of a sticking point with Evil Corp. The flow of the building rounds; buying businesses, making money, stealing other peoples businesses, all work really well. They also fit the theme and style of the game. The agents are definitely a nice addition, and their role in taking down another players evil plan fits. But the fact that the game at this point is decided on the roll of a die makes it a bit of a flat ending. It’s not the first time we’ve encountered this issue in board games. It also throws everything you’ve done to that point out the window. Other than as a resource to try and buy more cards right at the end, your cash and assets count for nothing in the endgame. Evil Corp has just launched on Kickstarter. We’ve expressed our concerns about the ending to the designers, and it seems we’re not the only ones to have done so. During the Kickstarter campaign they are looking into some possible alternates to how the agents work in the end game. We’re keen to see what these changes might be as, aside from the end game dice roll, we loved the aesthetic and mechanics of Evil Corp.